The Gwen Frostic Award was established in 2006 to honor individuals who have strongly influenced literacy in Michigan through authorship or illustration. From a kindergartner in a one-room schoolhouse in the Upper Peninsula of Michigan to published author, Shirley Neitzel has always shared her gift of using words to create a world for young readers to explore. Her first book, The Jacket I Wear in the Snow, was published in 1989. 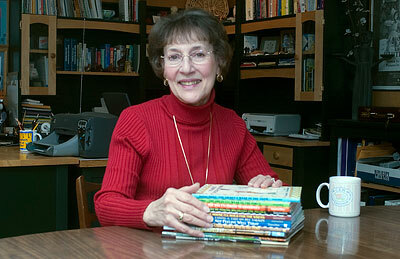 Since then, Shirley has published twelve more children’s books, authored two teacher guides, and presented in many schools and classrooms to spread her love of reading and writing. She is one of the original teachers who co-founded Peninsula Writers, a Michigan-based group established in 1984 that now includes over 100 writers. By serving on the PW board and actively participating in the retreats and small groups, Shirley mentors many new writers and nourishes other established writers. She helps give younger writers a start by participating in the annual Youth Writing festival at Calvin College. Her contribution and influence in the literacy community has been notice and appreciated for many years and will continue for many more. The Michigan Reading Association is honored to recognize Shirley Neitzel as this year’s recipient of the Gwen Frostic Award. * The Gwen Frostic Award was presented March 14, 2009, at the MRA Past Presidents’ Dinner, Grand Rapids Art Museum.